John, Shari, and me at the Caverns VW Camp Out vwcamperfamily event. 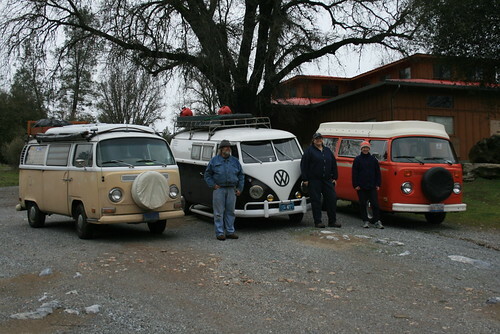 This weekend we joined Shari and her 1960 splitty and John and his 1971 Dormobile bus at the California Caverns. The camp out couldn't of been timed any better, as we had sunny skies driving across the valley and into the Sierra Nevada foothills. It was a nice break from all the crazy rain we've been getting. We arrived at the caverns around 2pm on Saturday, and found Shari already there behind the cavern welcome building. They had a small field set up for boy scouts in the back, which the cavern manager let us camp out at for free. There were picnic tables and even a rickety stage which had seen better days. We parked on a nice level grassy field right next to a stream which had swollen with all of the rain. In fact, a few days before, the grassy field that we were camping on was under water, but it was dry and pretty firm for us that weekend. Shari had a bunch of firewood, and Romy and I brought kindling. We hung out till dark, debating whether or not we should wait for John (who said he was coming) to take the cavern tour. But we decided to wait, and it was a good thing, because John came rumbling in just after sunset in his bus. We had just started the fire. 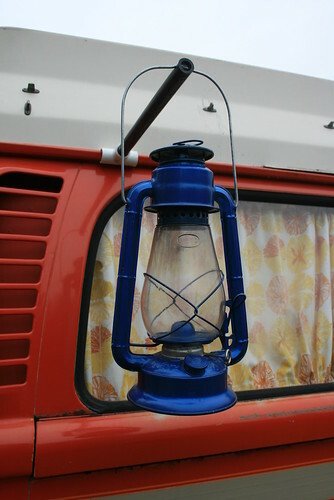 John found an old Dietz lantern in Arizona when he went to Buses By the Bridge last weekend. Since he had a lot of them already, he sold it to us, and we are now the newest members of the Dietz lantern vwcamperfamily craze/club! Woo hoo! The Dietz lantern from John. The next morning we went on the 11am cavern tour. We were the only ones there that morning, so we had a kind of private tour. The tour guide took us on a short hike to the historical entrance to the cave along the (usually) small stream. It was mined during the mid 1800s part of the California gold rush. I think she told us that about 28,000 ouces of gold were mined out of that stream, and you can see that there were a lot of piles of dirt and rocks that the miners threw around as they were hunting for gold. The story is that the miners were shooting empty whiskey bottles along a rock wall next to the stream, and as they climbed up to retrieve some of the bottles, rocks gave way underneath them and they felt cold air blowing out of the hole. They had discovered the first entrance to the cavern (back then called Mammoth Cavern). Some of the miners were determined to find gold inside, but they had no luck. 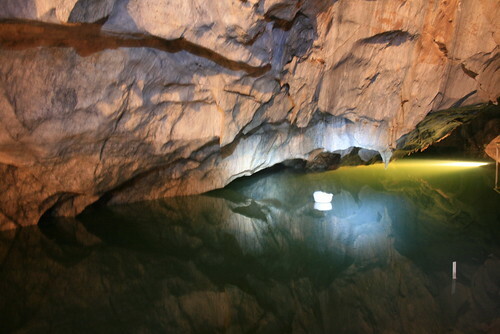 Instead they found a cave filled with many large rooms, and underground lakes. 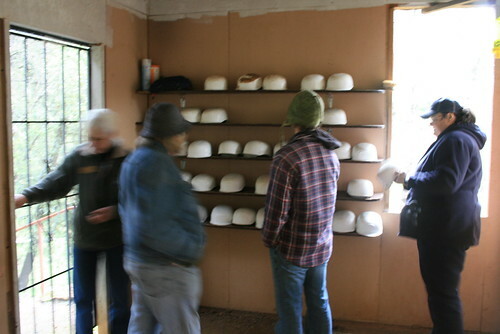 Getting our safety hard hats on before we go into the cave. We got to see almost all of the cave that you could walk through except one room which was flooded due to all of the rain. It was really beautiful! There were many soda straws hanging from the ceiling, and cave bacon, and flow-stone and the bridal room was really cool! I tried taking pictures, but many of them were blurry because it was so dark in there. In the late 1800s, the cave started to be toured, and the tourists all carved their name into the stone. Then for some reason, the cave was abandoned by 1920, and was left abandoned until 1983. During that time, people broke off a lot of the hanging features in the cave (which is sad). But there was also one man from Berkeley who found a secret room in the cave in the 60s and didn't tell anybody about it until the 80s. Because he kept it secret, it was preserved and we got to go see it. It was called the Jungle room, and had a lot of hanging formations. Many of them looked like animals, and there was even a Buddha! 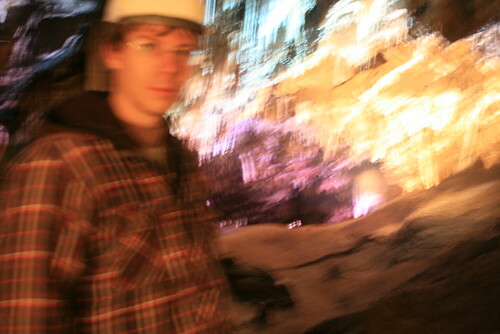 A flooded room in the cave, and a floating hard hat. In 1983 (I think) the cave was protected, and it is now part of the California State Historic Landmark system. It was also renamed to California Caverns. 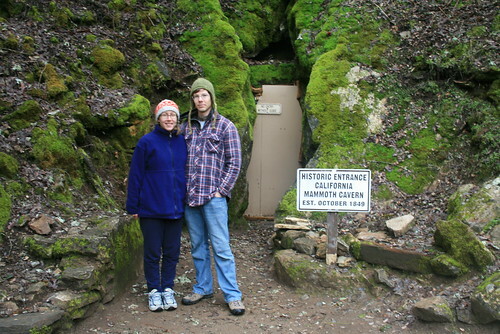 There are a few other caverns in the area, like Merced Caverns. After our tour was over, we packed up and started heading home. Well, Shari and John headed home. We were off to Wilbur Hot Springs. . . .